Together, husband and wife Eric and Julie Comstock create pattern designs and illustrations in warm, faded colors. 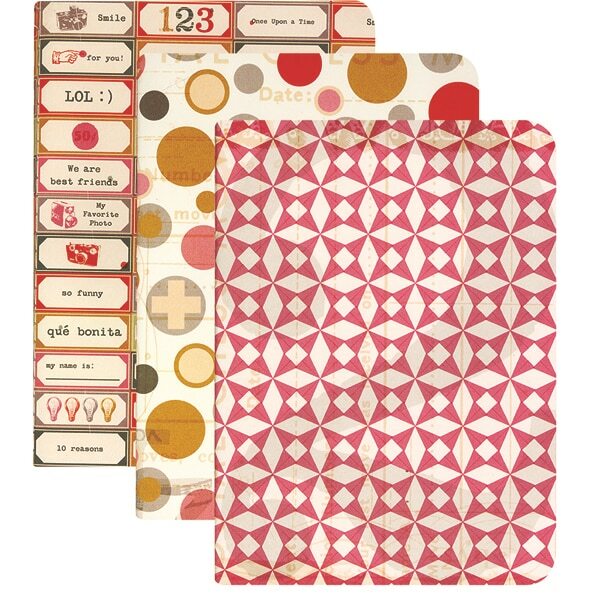 They variously cover the three "booklet" journals here with old-fashioned photo album labels, a bubbly pattern of dots, and an interlinking origami pattern. Made from environmentally friendly materials and bundled with unbleached twine, the 4½ × 6¼inch journals feature paper covers, rounded corners, and 48 pages with sewn bindings. The set contains a blank booklet, a lined booklet with super-slim 4mm rules, and a graph paper booklet with 4mm squares.